The Pioneer Press asks Is sprawl over? In what is believed to be a turning point in American history, new figures from the U.S. Census indicate that suburban sprawl might be coming to an end. For the first time in more than 60 years, the growth rate of Minnesota’s suburbs has plummeted, with some actually losing population. And when experts look at the reasons for the decline, they say that sprawl might be gone for good. That’s because long-term trends indicate less population growth, the demise of the single-family house and higher gas prices. Urban areas can easily adjust to such changes, with a variety of housing for a variety of people — rich or poor, young or old, families or singles, all serviced with mass transit. But not suburbs. They specialize in one kind of housing: big houses with big lawns for big families. The census figures are a warning for suburbs betting on more growth, including Forest Lake, Woodbury, Lakeville and Lake Elmo. Cities are scrambling to adjust, laying off employees and delaying public projects. Most home-builders are shrinking the size of their new homes or switching to cheaper townhouses or apartments. But changes are hard to make, despite the ominous census numbers. “I can only take that as banter,” snapped Jay Berger of Berger Built Construction, who just ended what he said was his most successful year ever, building single-family homes in places like Forest Lake. The farther the suburb, the greater the slowdown in growth. Growth in third-ring suburbs, including Afton, May Township and Scandia, was just 6 percent from 2000 to 2010 — a fourth of the percentage increase in the 1990s. Second-ring suburbs — such as Eagan, Inver Grove Heights, Woodbury and Blaine — surged 42 percent in the 1990s and just 23 percent in the past decade. In first-ring suburbs, growth stopped in the past decade after a 5 percent increase in the 1990s. These include Maplewood, Roseville and West St. Paul. The populations of Minneapolis and St. Paul have been roughly flat for two decades. The suburban growth slowdown reflects a metrowide slowdown, said Metropolitan Council research manager Libby Starling. Metro-area population growth was 15 percent in the 1990s and about 8 percent in the past decade, she said. Immigration from other countries has increased steadily, from about 5,000 annually in the early 1990s to about 11,000 today. But Minnesota’s population is like a leaky bucket — gaining immigrants but losing people to other states. In the 1990s, about 10,000 people a year moved to Minnesota from other states. But in the past decade, the state lost about 7,000 people a year. Said Starling: “The key question is how the Twin Cities competes economically in the next decade and how Minnesota plays into immigration,” both domestic and foreign. The suburbs’ growth also is declining because demand for their specialty — the single-family house — is falling. That style of housing defines two-thirds of American homes — yet only one-third of households has children, said Charles Marohn, president of Strong Towns, a nonprofit that advises Minnesota cities on development patterns. Props to my former student Chuck Marohn who is extensively quoted. 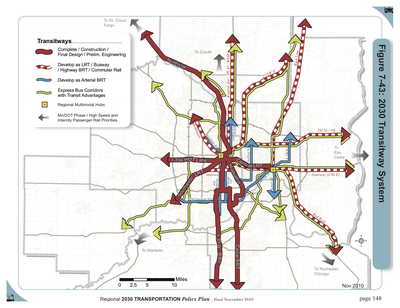 On p.148 of the Regional Transportation Policy Plan of Metropolitan Council is the 2030 Transitway System (shown to the right). I don’t like this map. There are substantive reasons I don’t like this map, having to do with policy. For instance, why does downtown Minneapolis act as the hub of this hub and spoke system (and St. Paul a secondary Hub) when it accounts for only 8 percent of the region’s jobs, and less than 1 percent of its residents? Shouldn’t there more of a web-like system, so that people can make cross connections. The plan should be reconceived as a grid, obviously with some importance for the historic center cities, but with a recognition of the decentered world of 2030. This is a perception bias of planners, who work in downtown St. Paul, about the residual importance of where they work. Second, why are insignificant (from a ridership perspective) routes like the Northstar given so much space while important routes, like many local buses on the high-frequency network, not even considered. Are buses not transit? Are bus routes not transitways? Third, why are serious plans (not to say wise plans, but there is definitely money behind it) like the Minneapolis Streetcar network essentially ignored. But there are also a lot of visualization reasons I don’t like this map. The poor visualization is a factor in poor-plan making, as it is indicative and reinforcing of muzzy thinking. A good map clarifies. Why are there arrows at the end of all the lines, don’t we know where they will end in 2030? If they keep going, use an arrow by all means; but if they stop, use a terminus symbol. Why are solid lines used both for things that are built (or at least under construction) and things that will be developed. Traditionally solid means exists and dashed means under construction or proposed. Here dashed red means “to develop”, but solid blue also means “to develop”, while yellow doesn’t say “develop” but seems to mean that at least in part, since most of the lines drawn yellow don’t have any real transit advantages yet (e.g. bus on shoulder, signal pre-emption, ramp meter bypass). (otherwise it should have been placed on the top with existing services). The legend should show existing services before proposed services. The thickness of lines is obtuse. Typically it should be standardized or represent something like frequency of service. Northstar is very thick, but has infrequent service, especially outside the peak. (Perhaps thickness is indicative of the money spent, rather than service provided). I know there are differences between Arterial BRT (which means a bus running on an arterial with transit advantages) and Express Bus Corridors with transit advantages, presumably having to do with the frequency of service, spacing of stops, and the exclusivity of the right-of-way. Nevertheless, this is quite confusing, since the point of using buses is the flexibility of switching links, having a bus route go from freeway to arterial, or arterial to neighborhood, etc. Further, red is used for existing HOT lane Express Bus service and I-35W BRT and Cedar BRT (and why is I-35W BRT different than I-394 HOT Lane? One station?) The existing BRT should be solid blue, the proposed future BRT should be dashed blue. The map should have both Miles and KM on the distance bar. There is nothing happening out west, why is valuable space used for that when the center could be blown up to good use instead. Lines overlap when there will presumably only be one service. Central Avenue has a blue line, then a yellow line, and next to both of those a dashed red line. Okay the Metropolitan Council does not know what is going on, but they will either develop it as one thing or another, not both. Similarly I-35W, or Broadway/Bottineau. Perhaps they mean it is an Express Bus Corridor with transit advantages, which might get upgraded, which is why solid and dashed lines should be distinguished. Then they could use a red/blue dash or something to indicate. The modes should be distinguished more clearly. Commuter Rail, LRT, and BRT all use red, but are quite different. There are a lot of colors in the rainbow (Red Orange Yellow Green Blue Indigo Violet), and others as well (Silver, Gold, Black, White) that could be used here. The report has photos, so 4-color printing is not the constraint.